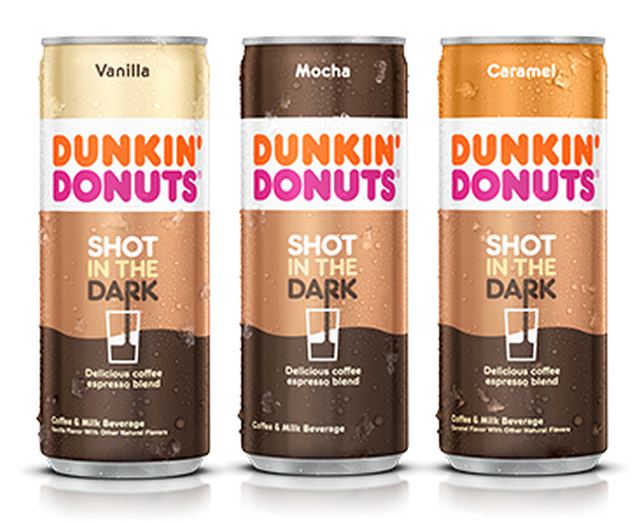 Dunkin' Donuts steps into the ready-to-drink canned coffee beverage category with the launch of new Shot in the Dark espresso-coffee blend. The new product features Dunkin' Donuts' signature coffee mixed with espresso and a touch of cream and sugar. The brand is positioning Shot in the Dark as "a little bolder than a traditional cup of coffee, but not as strong as a shot of espresso." Shot in the Dark comes in three flavors: Caramel, Mocha, and Vanilla. Each 8.1 ounce can contains 80 calories and carries a suggested price of $2.49. Dunkin' Donuts Shot in the Dark is currently available at select retail locations with plans to expand to more locations nationwide through 2019.